Prime Minister Narendra Modi-led-NDA Government has waged a war against black money holders and has so far announced taken several steps in the regards. While on one hand, the government has introduced amendments to the Income Tax Act in Lok Sabha which enables the imposition of a higher penalty on people who have unexplained deposits, on the other hand, the government is giving several chances to such people to come clean and declare their unaccounted wealth. For this, the government has launched several schemes and one such scheme is Pradhan Mantri Garib Kalyan Yojana, 2016. The scheme is similar to Income Declaration Scheme (IDS) which offered a four-month window to make declaration until September 30 and asked such people to make the payment for tax and penalty in three installments by September 30, 2017, with the first installment of 25 per cent tax till being paid till November 2016. 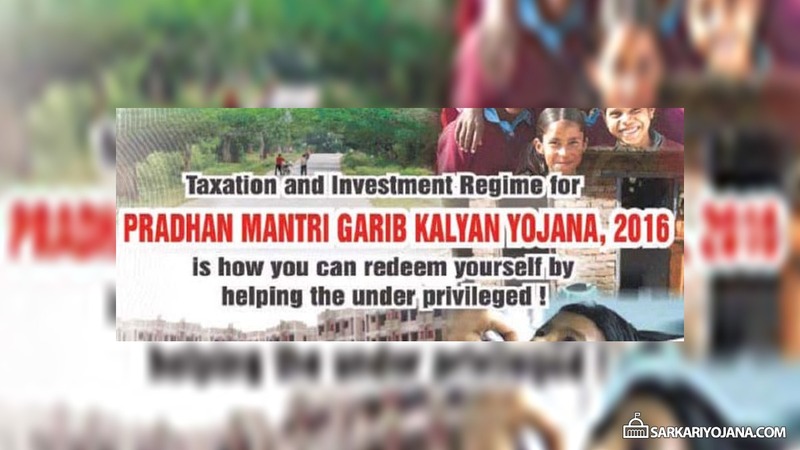 But under the Pradhan Mantri Garib Kalyan Yojana, 2016 the tax rate is much higher at 50 per cent and a quarter of the declared income will be locked by the government in for four years. This amount is will be utilized for the schemes of housing, irrigation, toilets, primary education, infrastructure, primary health, and livelihood. The other point that one should keep in mind is that the scheme is not for money made from illegal activities. Moreover, hiding facts may lead to loss of benefits and tax paid under the scheme. Under the Pradhan Mantri Garib Kalyan Yojana, a person will have to make a declaration under following three steps. After demonetization, the old notes of Rs 500 and Rs 1000 are no more legal tender and hence those hoarding the money as cash will have to ultimately have to deposit it in a bank or post office. After depositing the money, a person will be able to avail the scheme for the deposit. After depositing the money, a person will have to pay 30 per cent tax on income, 33 per cent surcharge on tax, 10 per cent penalty on income totaling to nearly 50 per cent of the income declared under the scheme. Apart from this, 25 per cent of the amount to be declared, in the Pradhan Mantri Garib Kalyan Deposit Scheme 2016 will, will be blocked for four years and interest will be paid on it. After declaring his money, the concerned person will have to declare his income through a declaration to the Principal Commissioner or the Commissioner notified in the Official Gazette for this purpose. Most importantly, the amount of undisclosed income that will be declared under Pradhan Mantri Garib Kalyan Yojana scheme shall not be included in the total income of the declarant for any assessment year under the Income-Tax Act. sir, i m completed my mca from distance education, ma(english)also and i have6 yrs exprience for computer teching. Me aapna inst. Kholna chahati hu. But loan nahi mil pa raha hai. and my age is 34. SO no chance for a job. How i can pass loan. Jinke Parivar ka naam se jameen registry hai Garib nahi hota. I am a CA willing to start a coaching centre but donot have funds for it Please advise wherefrom to have the funds at reasonable rate.